The English program at The International School develops and extends students’ reading, writing, listening, speaking, viewing and presenting skills. 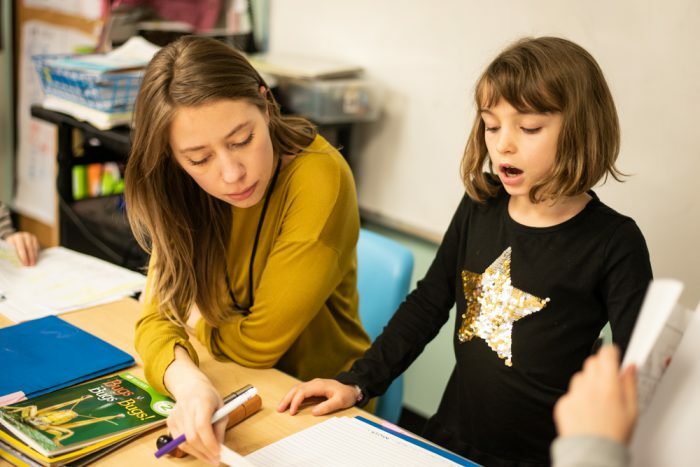 Using the Teachers College Reading and Writing Workshop, our program teaches language through inquiry with a focus on the developmental nature of language learning and that each child has their own time frame for successfully transferring literacy skills from one language to another. Small class sizes enable our teachers to focus on supporting each student to become strong independent readers and writers. The International School has six full-time English teachers. 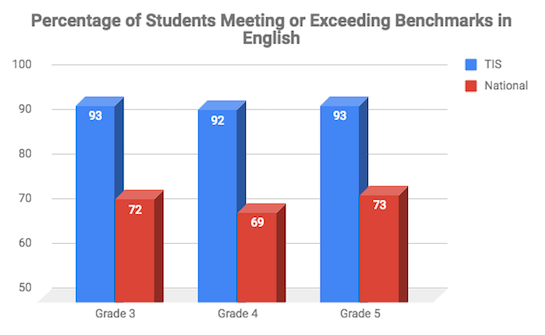 First graders attend English classes for one hour daily, while Second through Fifth graders attend for two hours every other day. Classes are mixed with students from different homerooms to support collaboration, knowledge sharing, and the overall sense of school community. Within the reading workshop, students in younger grades engage in a variety of activities that build foundational reading skills. Lessons focus on supporting a love for literature through read alouds, independent reading, and explicit instruction in phonics and fluency to support comprehension. In the upper grades reading workshop, students expand on their foundational skills through independent, guided and shared reading, genre studies, and literature discussions. Through the writing workshop, students draft, revise, and publish informative/explanatory texts, opinion texts, and narratives. English teachers provide authentic purposes for writing and guide students through each relevant step. Spelling, vocabulary, and grammar are explicitly taught through authentic writing experiences. Additionally, Handwriting Without Tears (HWT) is used to teach print and cursive. The English curriculum is aligned with the Common Core Standards, as well as the Primary Years Programme Language Scope and Sequence.